Retail. It's great, right? I mean, the recognition, the possibility for success, the easy advertising; it's awesome! Publishers can even take care of distribution and advertisement, saving developers from having to bankrupt themselves to produce a game. But wait, what if the game isn't a hit? Games that fail commercially are punished by the removal of their only chance to sell, while initially successful games are granted extra shelf life. 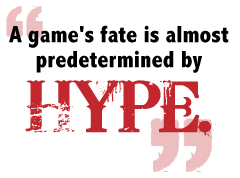 A game's fate is almost predetermined by hype, recognition and the current mood of the marketplace. Worst of all, commercial failure leaves a black mark on a developer's record, which keeps publishers from investing in the next venture. What happens to these games after they're removed from store shelves? Well, it used to be that they were relegated to bargain bins, online auctions and, of course, internet piracy. Any way you slice it, the developers aren't getting a cent, which gives them neither funds for a new project nor financial incentive enough to pursue one. Over the past few years, though, a new trend has been gaining traction: digital distribution. Using this, old or unsuccessful games have a chance to live on, and the developer gets a cut of the profit. The system's word of mouth potential helped Psychonauts - initially a tremendous commercial failure that sold fewer than 100,000 copies - rebound into something much less bleak. Positive buzz eventually caused it to reach 400,000 sales, without even counting downloads. The game currently holds an average rating of 9.4 out of 10 on Time Warner's GameTap, which ties it as the highest rated game on the service, alongside the likes of Planescape: Torment and the infamously overlooked Beyond Good & Evil. "It used to be very final and sad when a game went out of print," wrote Psychonauts creator Tim Schafer on his company blog, "but now that it can live on through digital distribution, it doesn't feel quite so dire." While this approach can work, some developers have chosen to bypass the retail channel entirely, such as Rare with Jetpac Refuelled. The game broke even within four months of its debut on Xbox Live Arcade and has continued to sell steadily. Jetpac Refuelled is far from the only game to be successful with such a service; sales for Xbox Live Arcade games are somewhere above 25 million, while Nintendo's Virtual Console service managed 7.8 million sales in less than 12 months. According to Rare's Nick Burton, Xbox Live Arcade games often experience a sales peak immediately following release, and then stay at a few hundred per day for as long as they remain downloadable. This gives developers "a guaranteed - small, but still reasonable revenue stream that's constant."